Osmania University OUCET 2nd allotment result 2017: The university further announced that the manual counselling for admission to Master of Physical Education (MPEd) courses will be held from 9.30 am on August 24 at the Admissions Directorate. It added that the manual counselling for all postgraduate courses will be conducted on August 28 from 9.30 am. 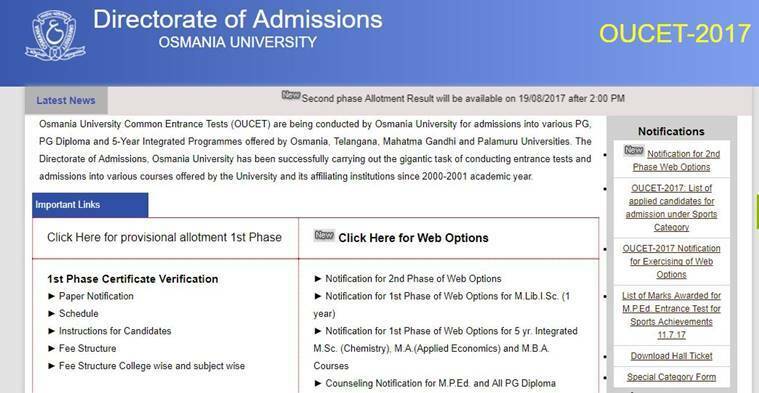 Osmania University OUCET 2nd allotment result 2017: The facility for web options for the second round for all candidates who cleared OUCET 2017 was opened on August 9. Osmania University has announced that it will release the results for the second phase of allotment through the university’s Common Entrance Test (OUCET) 2017 for undergraduate courses today. Candidates who have applied can check their allotment from the official website. “Second phase Allotment Result will be available on 19/08/2017 after 2:00 PM,” the university said in a notification. The facility for web options for the second round for all candidates who cleared OUCET 2017 was opened on August 9 and was closed by August 12 this year. The university further announced that the manual counselling for admission to Master of Physical Education (MPEd) courses will be held from 9.30 am on August 24 at the Admissions Directorate. It added that the manual counselling for all postgraduate courses will be conducted on August 28 from 9.30 am. Step 1: Go to the official website of the university (osmania.ac.in). Step 2: Under the “Admissions” tab, click on the link for the “Directorate of Admissions. Step 3: Follow the link for “OUCET 2017 notification”. Step 4: In the new page, click on “OUCET 2017”. Step 5: A notification will be available once the results are released. Click on the notification. Step 6: Enter your details in the fields provided. Step 7: Download the allotment result and save a copy.